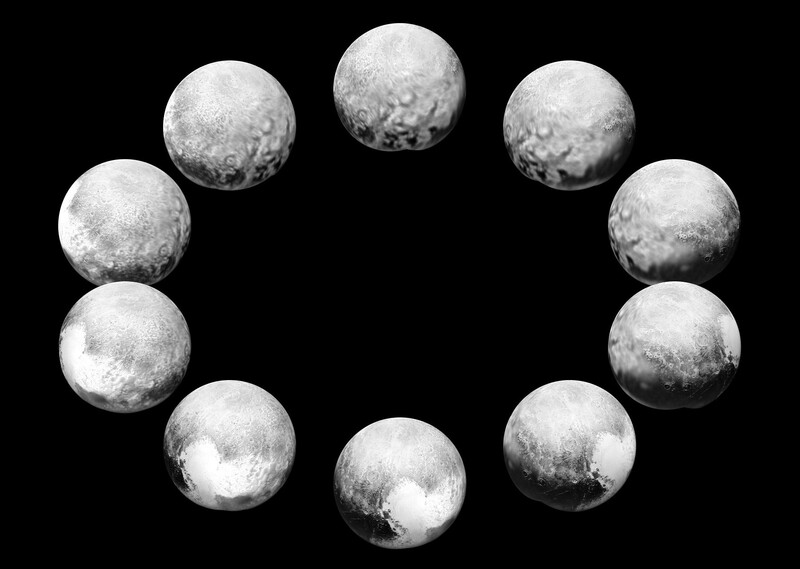 On approach in July 2015, the cameras on NASA’s New Horizons spacecraft captured Pluto rotating over the course of a full “Pluto day.” The best available images of each side of Pluto taken during approach have been combined to create this view of a full rotation. Click the image for a full-size version. Image credits: NASA/JHUAPL/SwRI. Pluto’s day is 6.4 Earth days long. 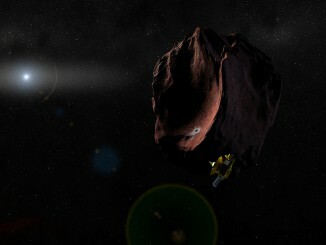 The images were taken by the Long Range Reconnaissance Imager (LORRI) and the Ralph/Multispectral Visible Imaging Camera as the distance between New Horizons and Pluto decreased from 5 million miles (8 million kilometres) on 7 July to 400,000 miles (about 645,000 kilometres) on 13 July. The more distant images contribute to the view at the 3 o’clock position, with the top of the heart-shaped, informally named Tombaugh Regio slipping out of view, giving way to the side of Pluto that was facing away from New Horizons during closest approach on 14 July 2015. The side New Horizons saw in most detail — what the mission team calls the “encounter hemisphere” — is at the 6 o’clock position. These images and others like them reveal many details about Pluto, including the differences between the encounter hemisphere and the so-called “far side” hemisphere seen only at lower resolution. Dimples in the bottom (south) edge of Pluto’s disc are artifacts of the way the images were combined to create these composites. On approach to the Pluto system in July 2015, the cameras on NASA’s New Horizons spacecraft captured images of the largest of Pluto’s five moons, Charon, rotating over the course of a full day. The best currently available images of each side of Charon taken during approach have been combined to create this view of a full rotation of the moon. Click the image for a full-size version. Image credits: NASA/JHUAPL/SwRI. 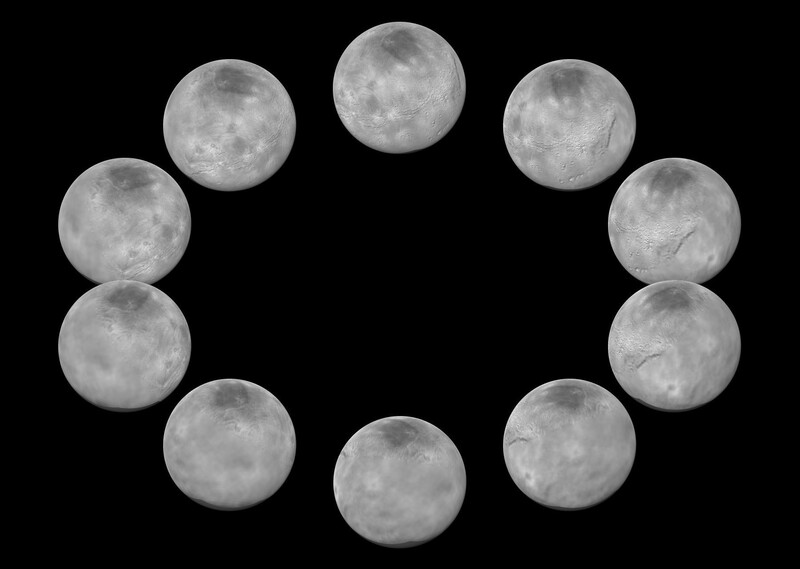 Charon — like Pluto — rotates once every 6.4 Earth days. 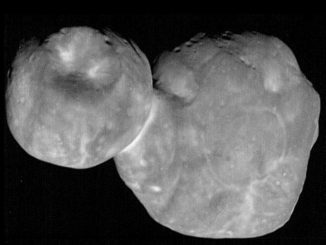 The photos were taken by the Long Range Reconnaissance Imager (LORRI) and the Ralph/Multispectral Visible Imaging Camera from 7-13 July, as New Horizons closed in over a range of 6.4 million miles (10.2 million kilometres). The more distant images contribute to the view at the 9 o’clock position, with few of the signature surface features visible, such as the cratered uplands, canyons, or rolling plains of the informally named Vulcan Planum. The side New Horizons saw in most detail, during closest approach on 14 July 2015, is at the 12 o’clock position. These images and others like them reveal many details about Charon, including how similar looking the encounter hemisphere is to the so-called “far side” hemisphere seen only at low resolution — which is the opposite of the situation at Pluto. Dimples in the bottom (south) edge of Charon’s disc are artifacts of the way the New Horizons images were combined to create these composites. 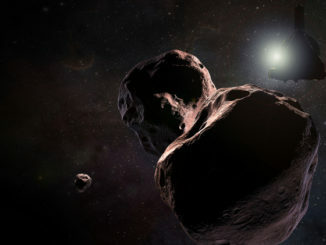 Scientists using the powerful Hubble Space Telescopes have identified three tiny objects at the frontier of the solar system that NASA’s New Horizons spacecraft could visit after making an historic flyby of Pluto next summer. NASA’s New Horizons probe, three years outbound from Pluto, has woken from electronic hibernation, healthy and on course for a New Year’s Day flyby of an even more remote Kuiper Belt object nicknamed Ultima Thule.